Lord Neville Farrington's day begins badly with an unannounced visit from his stern, unbending father, the Earl of Barsettshire, who is accompanied by Arabelle Martin, a most exquisite young miss. Immediately things started looking up and Neville unleashes his roguish charms hoping to seduce this prized beauty. But the high-minded gentlewoman scorns his advances. But Was Marriage To Be His Destiny? Of all the impertinence! Arabella has never met such a self-assured rogue who spends his days -- and far too many of his nights -- in the pursuit of pleasure. She rejects his bold caresses with disdain, but even Arabella cannot deny Neville's talents at seduction were oh, so enticing. 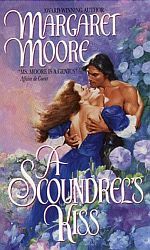 Arabella is determined to teach the handsome rake a thing or two about honor, but even she cannot resist this scoundrel's kiss. This is the first book in Margaret's Restoration series. The other books are A ROGUE'S EMBRACE and HIS FORBIDDEN KISS. "Margaret Moore has penned a delightful tale, brimming with witty repartee and a cast of finely drawn characters who step off the pages and into your heart. With color, depth and emotion, A SCOUNDREL'S KISS steals your heart." "What a pleasant surprise! A historical romance set in an unusual era if not an unusual place.... Moore's fascinating depiction of society during this era may come as a surprise to many who are not familiar with its free and easy ways. But, in fact, she paints an accurate picture of the excesses of Restoration life. Her interesting secondary characters -- both real and fictional -- convey very well the careless morals of the era."